Plate LVI. Red-shouldered Hawk, / Falco lineatus. Gmel, / Male, 1. Female, 2. The Birds of America, Vols. I - IV, London. 1827-1838. Audubon, John James, 1785-1851. Courtesy of the University of Pittsburgh. Used with permission. The University of Pittsburgh is fortunate to own one of the rare, complete sets of John James Audubon's Birds of America. It is considered to be the single most valuable set of volumes in the collections of the University Library System (ULS). 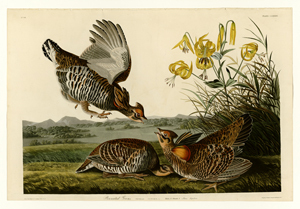 The library has digitized its Birds of America plates, along with Audubon's accompanying Ornithological Biography. Visitors to the Audubon website have access for the first time to both rich and complimentary resources. 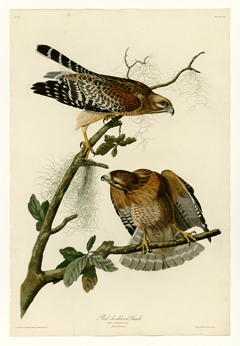 Audubon sold the engraved plates in a subscription series in England, Europe, and North America. 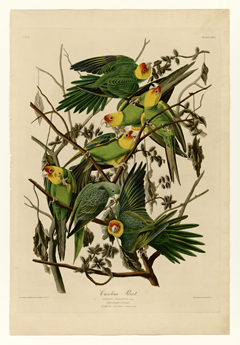 Original subscribers received five plates at a time (one large bird, one medium bird, three small birds) over a period between 1827 and 1838, at a cost totaling about $1,000. It is thought that no more than 120 complete sets exist today. Each set consists of 435 individual plates that are based upon the original paintings. Each plate was engraved, printed, and hand-colored, in large part thanks to Robert Havell of London. While William Lizars of Edinburgh engraved the first ten plates, Havell created the bulk of them and actually finished some by Lizars. Plate CLXXXVI. Pinnated Grous, Tetrao cupido. Lin Males, 1, 2. Female, 3. Lilium superbum. 1834. The Birds of America, Vols. I - IV, London. 1827-1838. Audubon, John James, 1785-1851. Used with permission. To replicate the actual size of some of the larger birds, Audubon insisted that Havell engrave the plates on Whatman double elephant folio size mold-made paper (26 x 38 inches), the largest paper sheets available at the time (known even then as "double elephant folio" size). Complete sets of the engraved, hand-painted plates were frequently bound together by their individual owners, normally into four large volumes. Each of the volumes weighed sixty pounds or more. Today, ornithologists, art historians, rare book librarians, and collectors consider Audubon's masterpiece the greatest work on North American ornithology ever published. Plate XXVI. Carolina Parrot, / Psittacus carolinensis. Linn, / Males, 1. Females, 2. Young, 3. / Cockle-bur. Xanthium strumarium. The Birds of America, Vols. I - IV, London. 1827-1838. Audubon, John James, 1785-1851 Used with permission. Both of these sets were acquired by William M. Darlington in the mid-nineteenth century and later donated, as part of his extensive library, to the University of Pittsburgh. Recognizing that the Darlington Memorial Library included significant historical materials, the ULS charted an ambitious course to digitize a large portion of Mr. Darlington's collection, including the Birds of America. The ULS Digital Research Library (DRL) scanned each of the 435 hand-colored plates at a high resolution by using its A0 DigiBook SupraScan device. Each plate was digitized at 400 ppi in 24-bit color using a linear array 14000 pixel CCD camera. The capture of such high quality images has produced master files in excess of 500 MB each. For displaying the images online, the DRL created derivative images using the flash-based Zoomify application. This viewing tool enables users to easily move around an image while viewing portions of the plates at 100%. Each of the 435 plates is accompanied by a brief descriptive record, which includes the engraved plate number, the name of the bird as designated by Audubon, the common name of the bird, the size of the engraved plate, and the plate caption, including the Latin scientific name of the bird. Rather than supply a detailed and lengthy description of each plate, the project team capitalized on connecting to Audubon's rich narratives presented in his Ornithological Biography, also owned by Mr. Darlington and scanned by the DRL. This functionality supports a key relationship for those desiring to read Audubon's observations and notes that he penned on each bird while examining the plates in great detail. Proceeds from the sales of individual plate reproductions support ongoing ULS preservation efforts. Reproductions are produced from the digital source using a giclée process and printed to scale on archival quality fine art mould-made paper. The homepage for Audubon's Birds of America at the University of Pittsburgh is <http://digital.library.pitt.edu/a/audubon/>.